Baseball. Roller coasters. Decadent dining. Swimming, shopping and ice skating. Live music, photography, and kayaking...oh my! That’s how we roll for summer vacations (and staycations) in Arlington, TX. Enviable Facebook posts await, so grab your family, friends, bestie or sweetie, and let Arlington amp up the voltage on your smile-o-meter. Two: Texas Rangers Baseball. With four recent post-season appearances (two for the World Series!) under our belts, Ranger Fever shows no signs of cooling. Tons of ticket options are available for seats and suites, ranging from “bare bones” to “livin’ large” budget-wise. 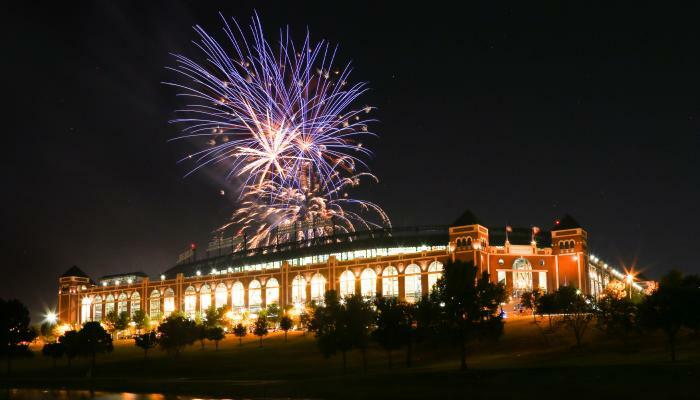 Why not make a weekend of it with a ballpark tour and discounted lodging with our Rangers Vacation Package? Go on, you’ve earned it. Three: Six Flags Hurricane Harbor. Two dozen rides + tree million gallons of cool water = great tan & cool summer fun. Now that’s my kind math! New to Hurricane Harbor this year is the park’s Beachside Grill, which will be open on weekends and feature DJ/live music as well as burgers, hot dogs, potato salad and other classic summer treats. Four: Arlington Segway Tours. Roll through some of the most scenic and iconic destinations in the Arlington Entertainment District, including Globe Life Park and the always impressive Caelum Moor of Richard Greene Linear Park. The five freestanding granite sculptures, located between Globe Life Park and AT&T Stadium, weigh a collective 540 tons! I like to think of them as Stonehenge in Arlington. Five: AT&T Stadium. America’s favorite team doesn’t gear up until August, but you can still nab an unforgettable up-close-and-personal look at one of the world’s top sporting venues when you take a tour at AT&T Stadium. Best of all, you’ll save big with one of our Tour Packages that offers discounts as impressive as the giant venue itself. Six: Arlington Highlands. Shop ‘till you drop and dine ‘till you’re feeling fine at your choice of 100-plus retailers, restaurants, bars, and entertainment destinations (including Studio Movie Grill and Dave & Buster’s) at the Arlington Highlands. One of my favorite indulgences is Melting Pot for an extensive wine list AND the ultimate sweet treat, which is drizzly, melty chocolate. Seven: Dallas Wings. College Park Center on the UTA Campus is home to DFW’s first-ever women’s pro basketball team. These women have big heart and mad basketball skills! Best of all, tickets are very affordable for a night of hoops and fun. Eight: Downtown Arlington. It’s the place to be if you want to take a stroll through the UT-Arlington campus, check out some of J. Gilligan’s famous Irish Nachos, sample the equally-famous fried chicken at Babe’s, or chill out with the unique pizza and beer offerings at Mellow Mushroom. Nine: ICE at the Parks. Practice your triple lutz (or something a lot simpler) at the ice rink at the Parks At Arlington. When you’re finished, it’s shopping (and shopping and still more shopping) until it’s time to catch a movie at AMC. TIP: Just order the small popcorn so you can hit the Cheesecake Factory for a delicious slice of cheesecake heaven! Ten: K-1 Speed. It’s not your mama’s go-kart, baby. Indulge your need for speed at this adrenaline junkie’s paradise that’s perfect for kids, kids at heart and anybody who loves fast-paced fun. Eleven: Levitt Pavilion. Free concerts under the stars in the heart of downtown Arlington, and you can BYOFAYLTD (food and anything you like to drink). Check out these 10 tips to help you rock the Levitt like a pro. Twelve: International Bowling Museum & Hall of Fame: Bowling in ancient Egypt….what? Believe it! Explore the interesting origins of the ancient sport, then pick up a customized bowling trinket for yourself. Did you know this fun-loving sport is being considered to become an Olympic event for 2020? Thirteen: Vivian Maier exhibit at Arlington Museum of Art. Born in New York City, Maier’s hauntingly beautiful images of street life in the City, Chicago, and Los Angeles weren’t discovered until the contents of an abandoned storage unit packed with hundreds of thousands of negatives, hundreds of rolls of film, some printed work, and audio recordings were auctioned off. Fourteen: River Legacy Parks: This 1,300-acre urban oasis is so beautiful that you have to see it to believe it. Hiking, biking, kayaking, picnicking, birding and other outdoor pursuits are all yours for the asking. The kiddos will love a visit to the Living Science Center Museum. Fifteen: Whole Foods. Warning: If you are a foodie, meet your new addiction! Indulge in organic and gourmet delights as far as the eye can see. Their deli offers delicious soups, salads, sandwiches, bakery items and a daily menu of main courses. Whole Foods is also a must-stop for lovers of craft beer, unusual gifts, and organic cosmetics. TIP: A Whole Foods wine and snack-filled picnic basket pairs wonderfully with a night at the Levitt Pavilion!